This year we’re aiming to help every student at St Mary’s to learn that it’s okay to not be okay. Every month, we’ll be holding events and shining a spotlight on the different issues you might face during your time at university. There are four aims to our SIMMS Mental Health campaign which are detailed below - we'll be updating you on our progress with these throughout the year, so make sure you follow us on Twitter, Facebook and Instagram. Did you know that your Union and University are here to help you improve your wellbeing and mental health? Aim one of #SimmsMH is to work with the University to ensure that there is a Mental Health Strategy in place for both students and staff. This will provide holistic support across the University for anyone who is facing mental health difficulties. Do you feel hesitant to talk about your mental health? Aim two of #SimmsMH is to shift our students' mind-sets to remove the stigma surrounding mental health. It's OK to talk, and it's OK not to be OK! Does university ever stress you out? 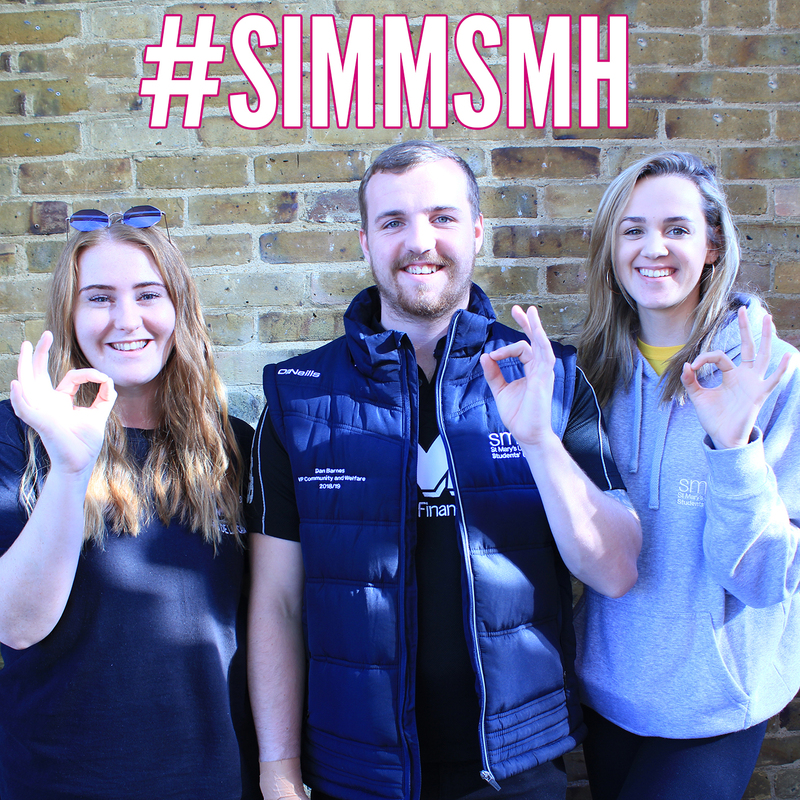 Aim three of #SimmsMH is to build a business case for a full time student advisor that would be dedicated to providing advice and guidance relating to any issues you may face regarding university life. They'll be able to help you out if things ever get difficult! Where do you go when you need your own space? Aim four of #SimmsMH is to open and develop an outdoor space that's there to improve your wellbeing - we'll be working to create a quiet space on campus where you can find peace and quiet. Spending more time in spaces like this is proven to improve your mental health! Get involved by sending us your #ItsOKNotToBeOK images on Instagram and Twitter - make sure you tag @stmaryssu in them so that we can see and share them.